As you might know, I have a thing with prefab homes. Always have. I love the idea of a cleverly designed home, fit for a contemporary lifestyle, put up in a matter of weeks, sometimes even days. 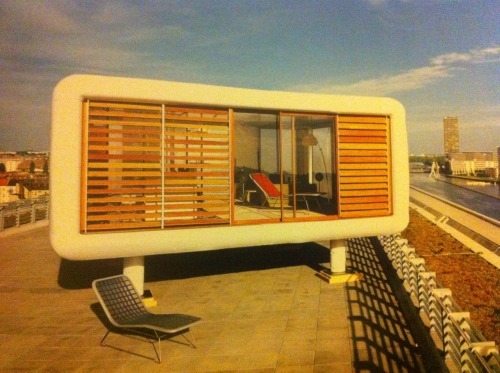 You can imagine how thrilled I was when I got this marvellous Taschen Book ‘Prefab Homes’ as a gift from friends. I am helping them with a design and install for a new bathroom and I recently had my birthday but still out of the blue they surprised me with this marvellous gift.The book is written by Arnt Cobbers and Oliver Jahn, two well-known architecture and design authors. I can highly recommend it. It’s the perfect coffee table book, with tons and tons of inspiring pictures and stories about various prefab home designs and their designers. The book is also available in the Homevoyeurs webshop for $47,38. You might be eligible for free shipping! This entry was posted in Design, designers and online finds, Famous buildings and movie locations, Products from the Homevoyeurs.com webshop, Unusual homes and tagged Architecture, book, design, Father's Day, gift, history, homes, Houses, idea, prefab, sale, shipping, Taschen. Bookmark the permalink.